Scarlet Oak Tree For Sale - Low Prices Online. Fast Ship! Scarlet Oak Tree is a good tree to use for shade. The Scarlet Oak Tree is in the red oak section with long glossy green leaves with seven lobes and is occasionally mistaken for the red oak, black oak, and the pin oak. It grows in a rounded shape in hardiness zones 4-9, and while it prefers regular moisture, the scarlet oak is very fertile, growing in different types of soils even in dry seasons. It grows with medium speed increasing its height by 13-24' every year before hitting 60-80' at its maturity. It is a popular landscape choice that provides red hue which extends well into the winter and develops into an open crown providing a light shade during summer. Scarlet Oak tree, is scientifically referred to as the Quercus vaccines. In all seasons, it exhibits a parade of red leaves on it. Early in springtime, new leaves would be seen combining well with the red ones. During the first snowfall, the red leaves would still be seen before they give way to the laws of nature. Scarlet Oak Tree would do well in many conditions mainly because of its wind resistance and tolerance for adverse soils, these two combined with its vivid colors explains why the tree is widely found in the parks, in the streets, and in the yards. In the District of Columbia, for example, the tree is regarded as the official tree because it has adapted well to the soils. It can be found almost everywhere. Hardiness zones of between 4-9 would be excellent places for the scarlet oak to grow in. The canopy formed by the tree not only provides shade but also adds to the beauty of nature. The blooming period is in March during spring. A mature tree grows to a height of 60-80 ft and may cover a space of about 40-50 ft. The tree is very versatile and grows in all soils except those that are alkaline. It has a lifespan of 80-180 years. 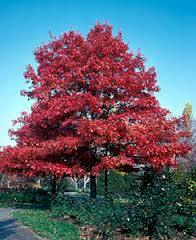 Scarlet Oak Tree also has a good appearance and is suitable for landscaping. It is right in any condition and can withstand dry conditions. It is an excellent choice for urban planting. The leaves are two-toned. The tops of the leaves are a dark green color, and the bottoms are a lighter green color. In the fall the leaves of this tree turn scarlet. The leaves in the fall make this trees name perfect for it. The top of the tree is open and round. This tree is a beautiful tree to have on a property. Scarlet Oak can grow to be around 80 feet high and will look magnificent during the summer and autumn. During summers months it will give beautiful green leans and in fall will supply an incredible burst of colors. Scarlet Oak can grow well in several different types of soils. These trees make excellent shade trees for large or average lawns. This is a great way to provide beauty almost all year round with the gorgeous colors that this tree offers. These are very easy to grow, and as they display their beautiful large crowns, the squirrels and a variety of birds love to sit and play in them. Large trees add a considerable amount of curb appeal as the leaves are a brilliant green and as they begin to change in the fall months and displays beautiful color.